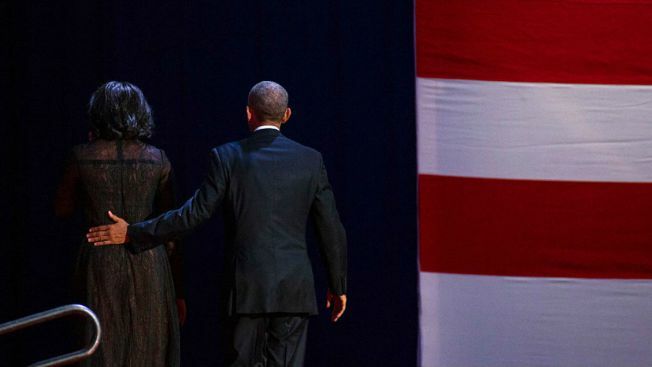 After an emotional moment brought tears and a resounding standing ovation for Michelle Obama during the president’s farewell address in Chicago, the first lady tweeted out a touching message of her own to the man whose side she has stood by through it all. The tweet followed perhaps one of the most heartfelt moments of President Barack Obama’s farewell speech. “Michelle Lavaughn Robinson, girl of the South Side,” he said. “For the past 25 years, you have not only been my wife and mother of my children, you have been my best friend." The president’s speech came less than a week after the first lady’s own goodbye address. Her voice breaking and eyes filling with tears, an unusually emotional Michelle Obama said Friday that being first lady "has been the greatest honor of my life" as she bid an early farewell to the White House. She is expected to visit "The Tonight Show" Wednesday for her third time for what's being billed as her last talk show appearance as first lady.